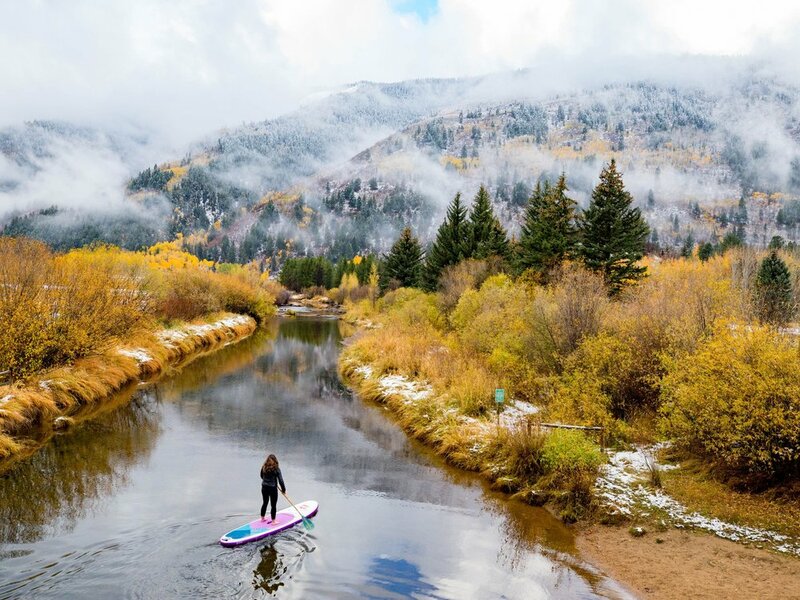 We have had some customers reach out and ask about winter paddleboarding tips. So we wanted to go ahead and write a quick blog on what we recommend while out on the water this winter! First off, we highly recommend having your gear planned out. We like to start with our feet and move up. There are lots of good quality water shoes/wet shoes to use. The thicker the warmer! This really helps, especially if the wind picks up, or waves come your way. We all know our feet can easily get wet. Some people have faith that they will not take a dip (even the pros can fall once in a while), so they wear sweats, or other workout clothes, the only problem with this, is it can really slow you down if you fall into the cold water. We recommend a nice dry suit, this allows you to stay warm above the water (wet suits get chilly out of the water!) and will keep you warm in the water. After that – this is the most important – a PFD! Make sure you have a good quality PFD, if worst comes to worst on the water and you go into shock, a PFD will keep you afloat. A close second in importance (all year round) is a leash – they literally save lives! So put one on whenever your paddling. Then lastly, you want a good pair of gloves, and a warm toque/beanie. Of course, temperature can really play a factor in your paddling attire, so dress for the occasion and make sure to check the forecast! Next, we will dive deeper into the different weather patterns, and paddling conditions that can arise in the winter months. Some days can be clear, and in the snap of a finger a white out rolls in. That’s why we highly recommend making sure someone knows exactly where you are and plan to paddle – the lone wolf isn’t cool in this scenario. If you take to long to come back, then help will have a general idea where you may be. We also recommend staying within sight of the shore, as conditions, and wind change, if you make it to far out it can be a struggle to get back in! It is also a good idea to bring a cellphone with you – or some type of communication device. There is a variety of dry bags that can hold your gear and keep it dry. It doesn’t hurt to include some warm clothes, hand warmers, and a snack in the dry bag as well. And lastly – make sure to have an absolute blast! Some days, when big snow flakes are falling, and the water is calm as can be, you cant help but feel at peace. We highly recommend trying it out. But always stay safe and check your local conditions! Keep a thermos of tea or coffee in the car waiting for you so if you have a chill, a sip of steaming liquid can warm you from the inside out. The most important thing to remember about winter paddling is to be Safe and Have fun. It’s still a beautiful world out there, even if it’s a little cold.